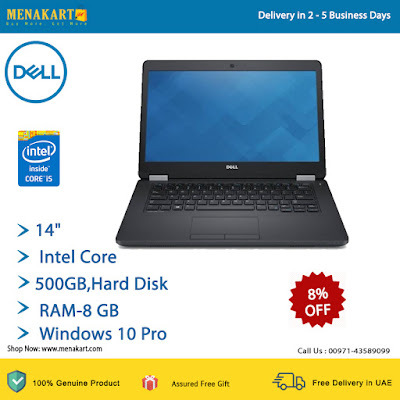 For those who are looking for a business notebook that can be relied on in terms of performance and features, the Dell Latitude laptop is an ideal choice. You can perform all your business tasks and more with this laptop. Whether it is accumulating files, downloading conten, or transfering large amount of data from other devices, the Latitude ensures that you always have a smooth experience. The Dell Latitude Laptop is powered by 2.6 GHZ Intel Core i7 processor, along with the Intel Integrated Graphics coprocessor, and a 8GB RAM. Everything works together to make your tasks run as seamlessly as possible. With a 500GB hard disk, you can store all your data in one place. The Dell Latitude comes to you with its 14 inches large screen so that work and fun can be executed on a traditional size monitor. Grey in colour, with slim screen, this Latitude bears a formal and professional look of a laptop. It also features an HDMI and a VGA port so that you can connect the laptop with your television and other compatible devices to watch your videos and other contents on a larger screen. The 3-cell lithium ion battery of this Dell Latitude laptop, figuring 43 WHr, lets you comfortably carry out all your tasks by allowing a good time-run of 4 hours. Latitude is light-weight too at only 1.9 kg, so that you take it wherever you like and switch on play and work at extreme ease.